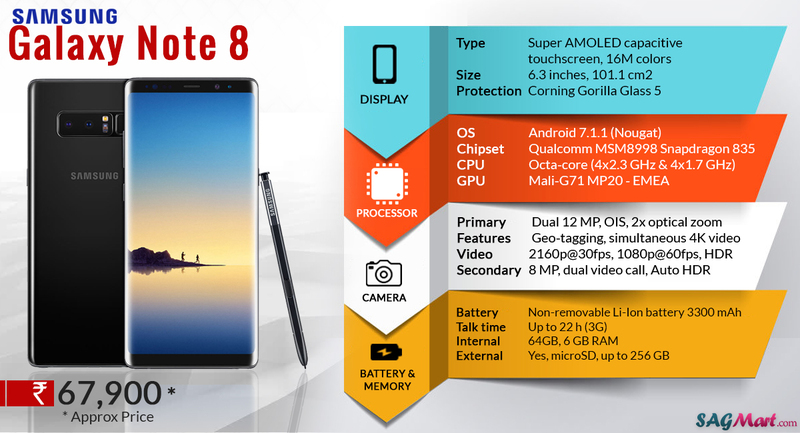 Samsung Galaxy Note 8 smartphone comes with Dual rear camera and fingerprint sensor. The Dual SIM device powered by Octa-core (4x2.3 GHz & 4x1.7 GHz) processor and 6GB of RAM. It packs device 3300 mAh non-removable Li-ion battery along with Dual 12+12-megapixel rear camera and 8-megapixel selfie camera. It operates on the Android 7.1.1 Nougat Operating System with 6.3-inch QHD+, Super AMOLED capacitive (1440x2960 pixels) touchscreen display. On the connectivity front, it offers 4G VoLTE, 3G, NFC, Bluetooth v5.0, USB Type-C, Wi-Fi a/b/g/n/ac options.